Two things fuel the current idiotic state of gun laws in the United States: the romantic tradition of the Old West and contemporary paranoia and fear. It began with the glorification of the gunfight, in which a pair of steely-eyed men — one good and one wicked, of course — faced each other on dusty streets at high noon and settled their differences. There’s a limited but semi-factual basis for that tradition. Those sorts of gunfights actually did, on rare occasion, take place. 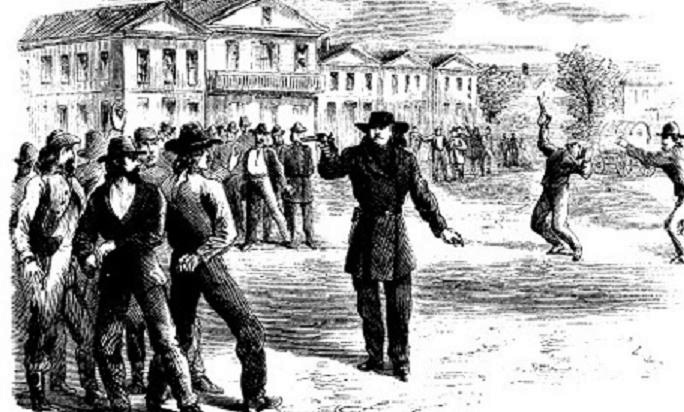 In fact today is the anniversary of the first recognized ‘high noon’ style gunfight. It didn’t take place at noon, though, and neither of the participants could be said to be entirely ‘good’ people, and there was nothing particularly romantic about it. But this is where the tradition was born. On this day in 1865, in the market square of Springfield, Missouri, a cowboy named Davis Tutt, who a few months earlier had been serving in the Confederate Army, faced off against James Butler Hickock, a professional gambler who’d served in the Union Army, first as a Jayhawker and later as a scout (if you’ve seen the movie The Outlaw Josey Wales, you’ve seen Jayhawkers — they were the ‘Red Legs’ who killed Clint Eastwood’s wife and child, and later massacred his companions as they were surrendering). Because of his prominent nose, Hickock’s fellow Jayhawkers called him Duckbill. By the end of the war, they’d begun calling him Wild Bill. 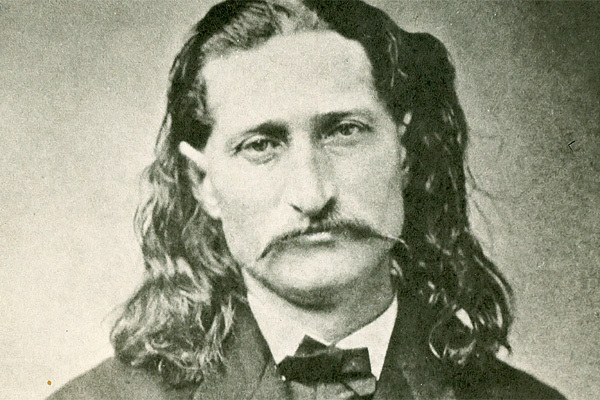 The gunfight was primarily over a gambling debt; secondarily, it involved disputes over women (Tutt had been paying ‘undue attention’ to Hickock’s girlfriend; Hickock, on the other hand, was believed to have impregnated Tutt’s sister). They met in the town’s square, stood somewhere between 50 and 75 yards apart, took up a sideways duelist’s stance, and drew and fired at about the same time. Tutt, who was generally accounted the better shot, missed. Hickock didn’t. A year and a half later, an account of the gunfight was published in Harper’s Magazine. It propelled Hickock from his status as “a desperado, a drunken, swaggering fellow” to that of a dime-novel hero. There is, let’s face it, something perversely attractive about the Old West mythos of the straight-talking and straight-shooting lawman. In reality, straight-talking was significantly less important than straight-shooting. It was the notion of straight-shooting that sparked the creation of the National Rifle Association. At the end of every war there’s always a group of people who say “Well, that’s done — now, how do we fight the next one?” At the end of the American Civil War, one of those people was former Union Army General George Wingate. He was appalled by the inability of city-raised Union soldiers to hit a target; it was estimated that for every 1000 rounds fired by Union soldiers, only one Confederate soldier was hit. Confederate troops, having a more rural background, were far more accurate. In 1871 Wingate and a few others created the National Rifle Association to rectify that situation. For a century or so, that’s what the NRA did — they taught firearm safety, they taught marksmanship, and they lobbied for sensible gun laws. That’s right, sensible gun laws in response to contemporary social circumstances. In the 1920s and 30s, for example, the NRA acted in response to the rise of gangsterism. 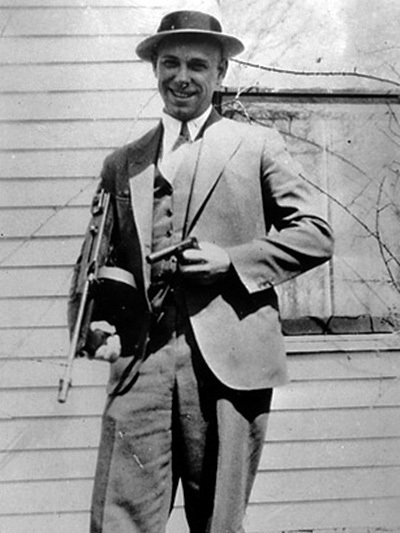 This was the era of Bonnie and Clyde, of Machine Gun Kelly, of John Dillinger. The NRA helped craft legislation to restrict the buying and carrying of guns; laws requiring a person to obtain a permit from local law enforcement in order to carry a concealed weapon, laws limiting those permits to people who had a valid cause to be armed, laws requiring gun dealers to report every gun sale to law enforcement, and laws imposing a waiting period on the purchase of weapons. They supported laws restricting the sale and ownership of automatic weapons and sawed-off shotguns, which were considered ‘gangster’ guns. Even as late as 1963, after the assassination of President Kennedy, the NRA supported a ban on mail-order gun sales. By the middle of the 1960s, the NRA had essentially become an organization devoted to supporting the interests of hunters and sportsmen. Then in May of 1967, something unexpected happened. The wrong people started buying, owning and carrying guns. A year earlier, in response to incidents of police violence, Huey Newton and Bobby Seale formed the Black Panther Party to protect their neighborhoods. 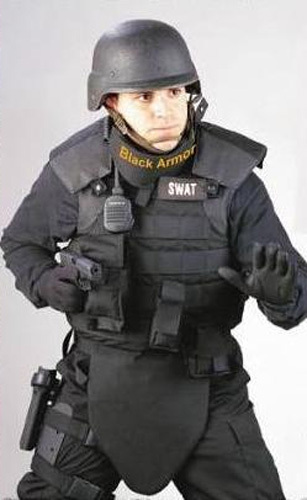 They began to openly carry firearms — mostly shotguns and handguns — while patrolling the streets. They also began to stockpile weapons. In response, a conservative Republican state assemblyman, Don Mulford, proposed a law that would prohibit the carrying of a loaded weapon in any California city. The governor of California, Ronald Reagan, supported the restriction, saying there was “no reason why on the street today a citizen should be carrying loaded weapons” and telling reporters the legislation “would work no hardship on the honest citizen.” The new legislation was presented to the public as sensible gun control, but everybody knew it was directed at one segment of the population. As one Black Panther said at the time, the law wasn’t about controlling guns; it was about controlling black people. The law passed. Of course it did. 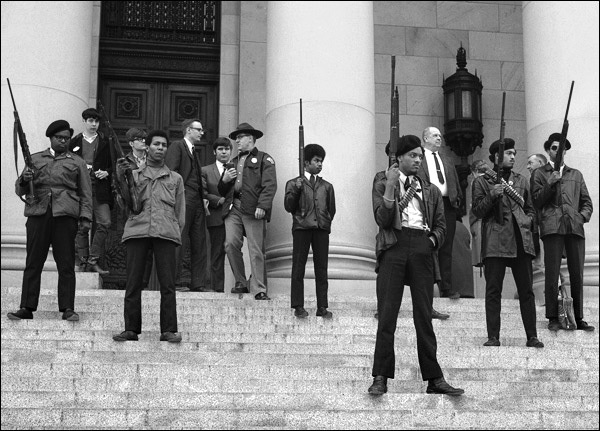 And on the day the legislation was debated, the Black Panthers marched, fully armed, to the state capitol. The following month began what has come to be called ‘the Long Hot Summer.” In June of 1967 there were race riots in Tampa, Atlanta, Buffalo, Boston, and Cincinnati. In July the riots spread to Detroit, Newark, Birmingham, Chicago, New York City, Milwaukee, and Minneapolis. The rioting continued through August. In the three months of summer, there were 159 race riots in the United States. Police and National Guardsmen who attempted to maintain order during the riots often became the targets of sniper fire. A couple of noteworthy things happened as a result of the riots. The Kerner Commission, established by President Johnson to determine why the riots took place and how future riots could be avoided, noted one reason for the level of violence was the easy access to firearms. That led to more very specific gun control legislation. People who’d been convicted of a felony or of drug possession weren’t allowed to buy a gun. In addition, small inexpensive handguns — known as ‘Saturday Night specials’ — were banned. Those laws received bipartisan support. Those laws, it should also be noted, primarily affected poor, urban, African-American communities. While this was taking place, the NRA began to splinter. One branch continued to remain primarily a sportsman’s support group; the other branch began to believe it was important for good people to arm themselves against the possible collapse of civilization. That branch actively worked to rescind some of the legislation the NRA originally supported, in order to make it easier to acquire firearms. The existence of the Black Panther party helped fuel the paranoid wing of the NRA, which eventually seized control of the group, turning it into the extremist political organization it is now. It didn’t matter that the Black Panthers self-destructed in a welter of drug abuse and criminality. Another terrifying enemy has always presented itself to the NRA. Communists, Muslims, the US government itself — there’s always somebody out to get them. Any attempt to place even the smallest restriction on firearms is now condemned by the NRA as part of some shadowy plot to seize all the firearms in the U.S. As a result, restrictions on gun sales, gun ownership and the ability to carry a firearm have been relaxed or eliminated altogether. Because we’ve perpetuated this romantic myth of gun play, and because a relatively small, paranoid, powerful gun lobby devotes a tremendous amount of money and effort to keep folks frightened, those of us who live in the US find ourselves in a nation in which a 24 year old kid can buy a full suit of tactical ballistic body armor, load up on weapons with high capacity magazines, and stroll into a movie theater and shoot 90 people. It’s worth noting, though, that even Wild Bill Hickock believed in gun control. When he was the marshal of Abilene, Kansas he required cowboys to surrender their weapons when they came into town. A man named Phil Coe, drunk and belligerent, encouraged by his buddies, refused to surrender his gun. When Hickock insisted, Coe drew his gun and fired. Hickock drew his own weapon and shot Coe twice in the abdomen, killing him. There’s a lesson to be learned there. Two lessons, in fact. Immediately after he shot Coe, Hickcock, out of the corner of his eye, saw somebody approaching him in a hurry. He turned and fired again, thinking it was one of Coe’s friends. It was, in fact, his own friend and deputy, coming to his aid. The man died on the spot. We need to remember that. There’s nothing romantic about a gunfight, and the gun doesn’t care who gets killed.